Dokken is an American heavy metal and hard rock band that was formed in 1978. The group accumulated numerous charting singles and has sold more than 10 million albums worldwide. The band was nominated for a grammy. Dokken was composed of founder Don Dokken on vocals, George Lynch on lead guitars, Juan Croucier on bass, and "Wild" Mick Brown on drums. In 1983 Croucier left Dokken in order to join Ratt and was replaced by Jeff Pilson. Currently, Dokken and Brown remain from the original line-up. Dokken was composed of founder Don Dokken on vocals, George Lynch on lead guitars, Juan Croucier on bass, and "Wild" Mick Brown on drums. In 1983 Croucier left Dokken in order to join Ratt and was replaced by Jeff Pilson. Currently, Dokken and Brown remain from the original line-up. After several personnel changes on guitar, Dokken's attorney Jon Levin stepped in to fill the role in 2004. In 2001, Barry Sparks replaced Jeff Pilson on the bass guitar. In 2009, Sean McNabb replaced Barry Sparks on bass guitar. Dokken was first formed around 1978 when Don Dokken teamed up with Jim Monanteras, Greg Leon, and Mick Brown. Prior to this, Don had been playing club shows in the Los Angeles area billed as "Airborn", but had to change it to Dokken because another band with the same name had already acquired a record deal. In 1981, Don Dokken flew to Germany to sing background vocals on the upcoming Scorpions album "Blackout" in order to assist the band's vocalist Klaus Meine who was suffering from a vocal ailment. While there, the band Accept was recording in another studio, and its manager was able to secure Don a deal with Carrere Records. "Breaking the Chains" was first released with this label in Germany under the name "Don Dokken", but shortly thereafter, Don met up with George Lynch and Mick Brown, who were playing a band called Xciter at the time. With the addition of Juan Croucier, Dokken finally had a steady line-up. Meanwhile in the United States, manager Cliff Bernstein discovered that Dokken was having success in Germany, and signed them in the United States. The band did an arena tour in the United States with Blue &Ouml;yster Cult in 1983, but when the tour was over the band was left with little money and was nearly dropped from the label due to the album's lack of success. While the band was very popular in Europe during this time, they had not yet made it onto the charts in the United States. Magazines such as Kerrang! blazed the trail for Dokken in the UK. Juan Croucier left Dokken in 1983 to join the band Ratt and was replaced by Jeff Pilson. 1984 became Dokken's breakout year in the US with the release of the album "Tooth and Nail" on September 13. The album contained several hit songs including "Just Got Lucky", "Alone Again", and "Into The Fire". The album sold over one million copies in the US alone and peaked at #49, while selling an estimated three million copies worldwide. On November 9, 1985, the band's third album "Under Lock and Key" was released. It also sold over one million copies with the singles "In My Dreams" (#24), "The Hunter" (#25) and "It's Not Love". 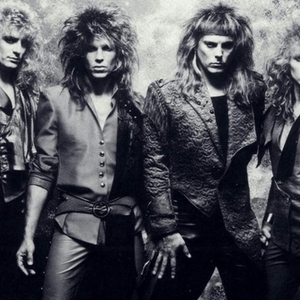 During this time in the 1980s, Dokken opened for such bands as Judas Priest, AC/DC, Aerosmith, and Dio among others. In 1986, "Heavy Metal Parking Lot", a documentary about concert goers before a Dokken and Judas Priest concert, was filmed and released. Following a successful tour with Scorpions, Dokken returned to the studio in December 1986 to record "Dream Warriors", a song for the movie "A Nightmare On Elm Street 3: Dream Warriors". The track brought the band to the attention of many UK hard rock fans. The song was released as a single (Dream Warriors / Back for the Attack) on February 10, 1987. After this release, the band took nearly half a year off before returning to the studio to record the album "[Album artist=Dokken]Back for the Attack[/album]". The album was released on November 27, 1987. It spawned the singles "Burning Like a Flame" (#20), "Heaven Sent" and "Kiss of Death" to become the band's most successful release, reaching #13 on U.S. charts. It also included a remixed version of the single "Dream Warriors" (#22), and the accompanying music video, which featured band members interacting with the film's characters, became popular on MTV. "Back for the Attack" became Dokken's third record to reach platinum status. Sculptor Steve Fiorilla's customized writhing skeleton guitar was the highlight of their video for "Burning Like A Flame". After releasing "Back for the Attack", the band toured as part of the Monsters of Rock Tour 1988 festival in the summer of 1988, along with Van Halen, Scorpions, Metallica, and Kingdom Come. Recordings from their April 1988 tour in Japan led to the release of the live album "Beast from the East" on November 16, 1988, which went Gold in the United States and charted at #33. The album scored one studio single, titled "Walk Away". A music video was also made for it. After the extensive 1988 tour, the band broke up due to creative and personal differences between Don Dokken and George Lynch. Many sources claim that the band did not "officially" break up until 1989, but this appears to be false. During this hiatus, Lynch and Brown formed Lynch Mob and recorded two albums: "Wicked Sensation" in 1990 and "Lynch Mob" in 1992. Don Dokken also recorded a solo album, titled "Up from the Ashes" in 1990, which spawned two singles. In 1991, bassist Jeff Pilson joined the McAuley Schenker Group for their 3rd album "M.S.G.". Afterwards he joined Dio in 1994 for the "Strange Highways" album. He also fronted the band War And Peace, while George Lynch released a solo album. Lynch's first solo effort, "Sacred Groove" reunited him with Don Dokken for the writing of the track "We Don't Own This World". Don Dokken was also supposed to sing lead on the track, however at the last moment, Don was unable to attend the studio session and was replaced by Matthew and Gunnar Nelson. After releasing "Up from the Ashes" in 1990, Don Dokken wrote another solo album in 1993. Titled "Dysfunctional", the album was recorded and produced in Don's studio. However, when John Kalodner wanted to sign him for the album, he suggested that George Lynch be brought back into the band so that the album could be marketed as a Dokken album, and not another Don Dokken solo effort. Despite the fact that the tension between Lynch and Don Dokken was the cause of the band's 1988 split, the two agreed to put their problems behind them for the time being. The band re-united in 1995 along with Mick Brown and Jeff Pilson, with Lynch re-writing and re-recording the guitar solos on the album, which were originally conceived by Don. Dokken was signed with Columbia Records, and the album still managed to sell over 300,000 copies despite the decline in popularity of similar bands during this time. During the tour supporting "Dysfunctional", however, old tensions between George and Don had resurfaced and the band once again began to split apart. During a Columbia promotion for the new album in which the band was scheduled to play live on 120 radio stations, Lynch unexpectedly left the studio and refused to re-enter. The record company was forced to air the rehearsal tape that had been recorded earlier, and four days later the label dropped Dokken, presumably because of this and other similar incidents involving Lynch's behavior. "One Live Night", a live acoustic album was released in 1996 by a new label, CMC, and was followed with "Shadowlife" in 1997. Don Dokken was dissatisfied with "Shadowlife", an album in which George Lynch took total control and even went as far as to replace the original Dokken logo on the album. Don alleges that George intended to destroy the band with this album, reciting the following quote from Lynch in an interview: "This is the perfect record. This is gonna be the end of Dokken, and that is what I wanted to accomplish." In late 1997, Lynch left the band abruptly when he refused to participate in the band's European tour. Needing a guitarist to fill in on the scheduled dates, Don Dokken looked to Europe guitarist John Norum, who had previously played on his 1990 solo album and was familiar with the band's catalog, to help him finish the tour. Lynch tried to re-join the group just days before the tour began, but was told that he was "out" by the rest of the group. A lawsuit followed in which Lynch sued the band for $1 million, but the band prevailed in the verdict. After the European tour, guitarist John Norum was unable to continue with the band as he had previously committed to another solo record. The band then hired former Winger guitarist Reb Beach for the job, and recorded an album with this line-up in 1999 aptly titled "Erase the Slate" to signify a new beginning for the band. Dokken released another live album titled "Live from the Sun" in 2000 before the departure of guitarist Beach. Beach, who wanted to work on some other projects and could not commit to Dokken in the long term, was replaced by John Norum, who was now in between projects and able to participate in the band's touring schedule. Bassist Jeff Pilson also left the band and was replaced by Barry Sparks. In a 2004 interview, Don Dokken stated that Jeff left because "he wanted to do something different and didn't want to keep playing these songs over and over again." Of the original members, only Dokken and Mick Brown remained. This line-up released the album "Long Way Home", but Norum suffered a hand injury during the band's 2002 spring tour of Europe in support of the album, and had to be replaced by Alex De Rosso, previously of the Italian metal band Dark Lord. That year, Dokken was featured in the Metal Edge Rock Fest tour along with Ratt, Firehouse, and other similar acts. In the spring of 2003, Dokken embarked on an extensive tour of the United States opening for Scorpions and Whitesnake. After the tour, however, guitarist Alex De Rosso lost his visa and had to return to Italy, at which point Don Dokken called Jon Levin who formerly played guitar on Doro's "Force Majeure", and also had previously met with the band and played a single show in 1998. Levin joined the band, and the line-up of Dokken, Brown, Levin, and Sparks would remain through 2008. Dokken released the album "Hell to Pay" in 2004, which was seen by critics as a modern approach to the band's style. The band continued extensive touring in 2005 and 2006. 2007 saw the release of both a live CD and a compilation DVD. The CD, titled "From Conception: Live 1981", is a previously unreleased live recording from the band's early years which Don discovered in their master vault. The DVD release, titled "Unchain the Night", was first released on VHS in 1986 and is a compilation of the band's music videos along with interviews and other footage. The band also performed at the glam metal festival Rocklahoma in both 2007 and 2008. On May 13, 2008, Dokken released their first studio album in four years titled "Lightning Strikes Again", which was met with increased commercial success and became the band's highest charting album in 13 years when it debuted at #133 in the United States. The album has been referred to as a return to the band's signature sound, and reviewers have said that the songs follow the classic Dokken formula. Don Dokken told interviewers that Jon Levin was the bandmate who wanted the band to make an album with the classic sound in mind, and remarked that the process was difficult, saying: "I had to get back in that mindset. This is what the fans wanted, and if I stay focused on that I would give them a straight-ahead Dokken record." During the spring and summer of 2008 in order to promote the new Dokken album, Don Dokken and Jon Levin participated in dozens of interviews including Rockline, KNAC, The Classic Metal Show, as well as a series of podcasts available on the band's website. During the summer of 2008, the band performed on tour in support of the "Lightning Strikes Again" album with Sebastian Bach and Poison. Sparks and Brown were not part of the summer 2008 touring line-up. Brown signed on to play with Ted Nugent for the summer before Dokken was offered the slot on Poison tour, making him unable to tour in support of "Lightning Strikes Again". Sparks was in Asia performing with a stadium act and was unable to tour with Dokken until he was able to get his wife, a resident of Italy, a visa. Chris McCarvill from House of Lords played bass. Jeff Martin of Racer X and Badlands fame played drums for the 2008 tour until he was fired by Don Dokken. Chris McCarvill's House of Lords bandmate B.J. Zampa filled in as drummer for the remainder of the tour. Since then, Dokken has continued to tour extensively with Mick Brown back on drums with BJ Zampa filling in on drums when Mick is busy touring with Ted Nugent and Sean McNabb of Quiet Riot and Great White fame on bass, along with Levin on guitar and Dokken on vocals. In the summer of 2010, the band opened for the legendary rock band Scorpions selected dates of their U.S. tour. On March 1, 2010, Dokken digitally released "Greatest Hits", a collection of re-recorded songs from their '80's albums along with two new tracks, to iTunes and Amazon.com. The physical album with additional tracks was released on King Records (Japan) on April 21, 2010 and is available in the United States through Cleopatra Records. On November 29, 2009, during an encore at a Dokken show at The House Of Blues in Anaheim, George Lynch and Jeff Pilson joined Mick Brown and Don Dokken for two songs, the first time they were on stage together in 12 years. In early 2010, Lynch announced a reunion of Dokken's glory days line-up. The announcement was followed by a retraction on February 24. In May 2010, George Lynch and Don Dokken appeared together as guests on Season 5, Episode 7 of television show "That Metal Show". Dokken and Lynch Mob are still touring through the summer and fall of 2010. Members and ex-members of the band have appeared on various tribute albums. George Lynch played guitar on "Anthem" on a tribute album to Rush. George Lynch and Jeff Pilson have appeared on tribute albums to Iron Maiden. Jeff Pilson also appeared as the bassist for Steel Dragon in the movie "Rock Star" (starring Mark Wahlberg and Jennifer Aniston), which was loosely based on Ripper Owens rise to stardom as the vocalist for Judas Priest. They also appeared in Dio's "Hear 'n Aid" in the '80s, and were featured prominently in the music video. In the mid-80s, Don Dokken sang lead vocals on the hit single for Scorpions drummer Herman Rarebell's first solo project Herman Ze German and Friends. The song is a power ballad titled "I'll Say Goodbye". Don also sang lead vocals on the song "Hard Sensation". In 2009, Dokken appeared in a series of commercials for Symantec's "Norton Internet Security 2010". The advertisements imagine a computer as a chicken and Dokken as a malicious computer virus. Each ad features a different outcome, based on whether or not the "Dokken Virus" was allowed into the system. In the episode of the sketch comedy series, Wonder Showzen titled "Space" a baby is seen with acne in the shape of the Dokken band logo. In an episode the animated MTV show Celebrity Deathmatch, the band was mentioned by James Hetfield of Metallica when he fought against Fred Durst of Limp Bizkit, saying that he'd prefer fighting one of Slayer's or Dokken's members instead of Durst. In June 2010, both Don Dokken and George Lynch appeared together in an episode of "That Metal Show". In the episode, they claimed that the main cause of their rift was a publicity stunt that they both eventually started to believe. George also stated that Don also wanted to "take all the money and all the credit" didn't help, with Don nodding during the statement. They both also mentioned that they would love to have a reunion with Don, George, Jeff, and Mick, but that they are all too busy with other projects in 2010 (between Dokken's current lineup, Lynch Mob, Jeff's involvement with Foreigner, etc.). They did not rule out a 2011 reunion.